Templates to print on fabric or paper for the Dresden Plate and Fan quilts. 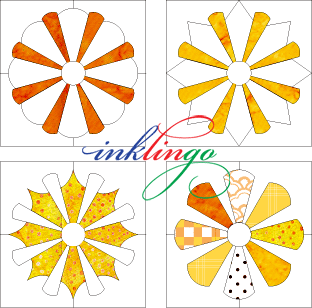 You can be more creative with Dresden Plate, thanks to Inklingo. The variety of blades and techniques for Dresden Plate and Fan designs gives you so many great options that it almost seems wrong to simply call it "Dresden Plate." Dresden Plate with a choice of 15 blades! Which of the FIFTEEN different Dresden Plate blades will you choose? 8, 12, 16, or 24 in a plate? Will you appliqué or piece? By hand or by machine? Back-basting or templates? Whatever method you choose, you will always have perfect positioning, thanks to the precise cutting and stitching lines printed on the fabric. Use your favorite method and finish a quilt that will make you proud. Design books have the "how to." Downloadable Shapes are the shapes to print on fabric. The Dresden Plate Design Book (half price or free) will help you sew these wonderful blocks, whether you are following a traditional pattern or creating your own design. It is an amazing resource for professional pattern designers too. If you buy the design book first ($10), the payment is credited when you buy the shapes (details). See why quilters love Inklingo for Dresden Plate. There is an Inklingo shape collection for you whether you prefer appliqué or piecing, machine or hand. If you piece the blades, you can appliqué them to a background (printed or unprinted) or piece them into backgrounds printed with the perfect curves and matching marks. Think about it—no worries about centering the plate!! Wow! You can also mix and match, combining foundation piecing and appliqué. For example, if you like a blade in Basic Pieced, you can appliqué the plate to an unprinted background instead of piecing. The options are endless. 8, 12, 16, or 24 blades in a plate! See the variety of widths and shapes in each collection by clicking on the covers (above). The back-basting layouts in Appliqué allow you to combine narrow and wide blades and different blades in the same block! The diagrams for each shape and Monkey's Cheat Sheet keep you organized and make it easy to decide how much fabric to buy—or whether you have enough in your stash. Use scissors or a rotary cutter. No measuring, no templates! No expensive tools required and there are perfect stitching lines and matching marks on every piece! This PDF (74 pages) includes everything you need to know to design and sew your Dresden Plate. You can buy the shapes for your favorite method and have exactly what you need.